Elaine is having nightmares and sleepless nights due to her neighbor's inconsideracy. The neighbor is out of the country and has left her alarm clock set for 3:30 a.m.. George gets a dream job at a very badly run company, his new boss seems familiar to him, then a photo in the boss's office reminds him of "the boom box incident." Fearing that he might lose his new position, George listens to Kramer's advice and plots to get hold of the photograph and get it retouched. 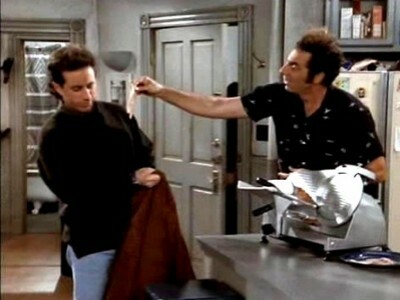 Kramer's dissatisfied with the meat he is getting with his sandwiches, so he obtains a meat slicer. Kramer suggests Elaine that she short circuit her neighbor's apartment and blow the circuit breaker. Jerry is going to go out on a date with a doctor that Elaine recommended, but the date is annoying when the doctor can only talk about saving lives. The photo lab screws up the retouching by eliminating the boss from the photograph and not George. Jerry discovers the doctor is dermatologist. George recommends a carefully orchestrated revenge date. Kramer uses the meat slicer to help Elaine feed the neighbor's cat; the power outage shut off the automatic feeder. Jerry's revenge date goes well, until he is reminded of the phrase "skin cancer." Elaine is still using the slicer and finds it very handy, until she tries to even her high heels. George goes back to the photo shop to find they put the boss back in the photograph as a cartoon. He now needs to obtain a new bare-chested photo of his boss or find a new job, perhaps the Coast Guard. Jerry's doctor date would provide the perfect opportunity for him as she does skin cancer screenings. Elaine keeps the slicer problem from Kramer by threatening him with seeing some circus clowns. Later, Kramer goes to her apartment to pick up the slicer; she fixes it and quickly shoves it out the door. Kramer sees the dinged up blade and tries to get back into her apartment, but he takes the knob of the door. Jerry has developed an allergic reaction to something as hives have broken out on his neck. Elaine discovers she is trapped inside her apartment. Jerry goes down to George's workplace and confronts the doctor about his hives. She leaves and Kramer, in his white meat slicing coat, steps in as the skin cancer doctor and spots a growth on George's boss. George gets his bare-chested photo. Kramer wants to come clean about the growth; George tells him he will tell his boss to see another doctor. George's boss doesn't think it is a problem, a ten-year-old photo of him shows the mole, it hasn't changed. He also relates to George the story about the dumb guy on the beach with the boom box. He mentions to George (as others have) that he sure has lost a lot of hair in the past ten years. Despite all of that, he gets to keep the job. Later, the guys keep Elaine company as they wait for the locksmith to come and open her apartment. Kramer ihastuu ohueen lihanleikkuriin, Jerry tapailee ihotautilääkäriä ja Elainen naapuri jätti kissan lukkojen taakse. Elaine ist mit ihren Nerven völlig am Ende, und Schuld daran ist der Wecker ihrer Nachbarin. Das höllische Ding klingelt ununterbrochen. Weil sich Elaine nicht mehr anders zu helfen weiß, nimmt sie einen Rat Kramers an: einfach die elektrische Leitung in der Nachbarwohnung zu kappen. Wie sich schnell herausstellt, war das keine so gute Idee. Inzwischen löst auch George ein mittleres Chaos aus, als er versucht, sich von einem Familienbild seines Chefs wegretuschieren zu lassen. George ha un nuovo impiego, ma teme che il suo datore di lavoro possa ricordarsi che in passato ha avuto una lite con la sua famiglia. La vita di Kramer cambia completamente prospettiva quando compra un'affettatrice automatica. Elaine ha dei problemi con il vicino, mentre Jerry inizia a frequentare una dermatologa, anche se non ha molto rispetto per questa categoria di medici. El vecino de Elaine se ha ido de vacaciones y se ha dejado puesto el despertador a las 3.30 de la mañana, lo que altera el sueño de la chica. George tiene un nuevo trabajo, pero su jefe le suena de algo y no sabe de qué. קריימר אינו מרוצה מחיתוך הבשר המסחרי ולכן הוא קונה לעצמו חותך בשר, אלא שהעניינים יוצאים מכלל שליטה. בינתיים, איליין אינה מוצאת מנוחה כאשר השעון המעורר והחתול של השכן משגעים אותה, וג'רי כל הזמן מתעצבן על הדייט שסידרו לו. Insatisfeito com qualidade das facas de cortar carnes comerciais, Kramer compra seu próprio cortador de carne, e as coisas acabam indo longe demais. Elaine não consegue dormir com o alarme e o gato de sua nova vizinha.